galaxy may have been created by the cataclysmic collision of two older galaxies. The infrared light was captured by the European Space Agency’s Herschel Space Observatory. The X-ray observations were made by the European Space Agency’s XMM-Newton space telescope. Centaurus A is the closest giant elliptical galaxy to Earth, at a distance of around 12 million light-years. The galaxy was observed by astronomer Sir John Herschel in 1847 during his survey of the southern skies. Now, more than 160 years later, the observatory bearing his family name has played a unique role in uncovering some of its secrets. With the Herschel observatory, the giant black scar of obscuring dust crossing the center of Centaurus A all but disappears when viewed at long infrared wavelengths. The images show the flattened inner disk of a spiral galaxy, the shape of which scientists believe is due to a collision with an elliptical galaxy during a past epoch. The Herschel data also uncover evidence for intense star birth toward the center of the galaxy, along with two jets emanating from the galaxy’s core, one of them 15,000 light-years long. Newly discovered clouds co-aligned with the jets can also be seen in Herschel’s view. The XMM-Newton X-ray observatory recorded the high-energy glow from one of the jets, extending more than 12,000 light-years away from the galaxy’s bright nucleus. XMM-Newton’s view shows not only the way that the jet interacts with the surrounding interstellar matter, but also the galaxy ‘s intensely active nucleus, and its large gaseous halo. 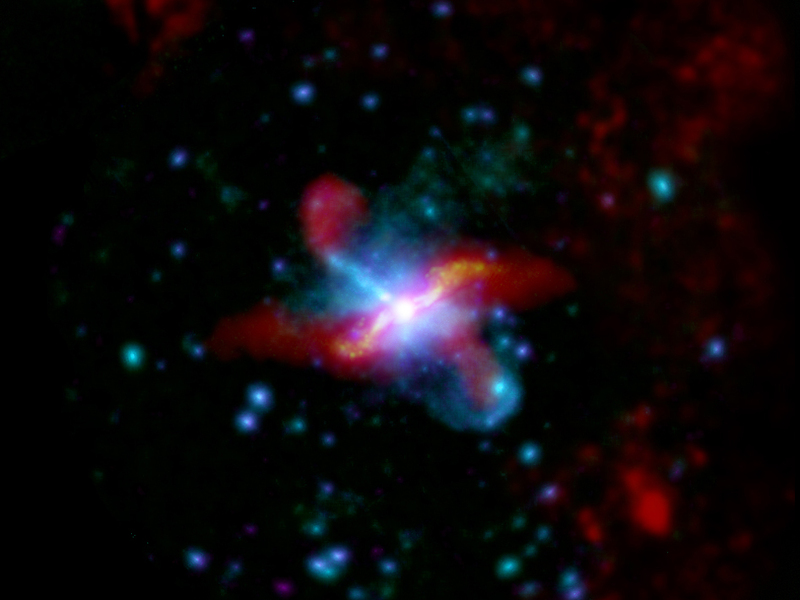 The jets seen by both satellites are evidence of the supermassive black hole at the center of the galaxy.